America’s top central bankers didn’t make time for inequality at their annual hobnob last week. Over in Germany, the world’s Nobel Prize winners in economics did. But few Americans noticed. 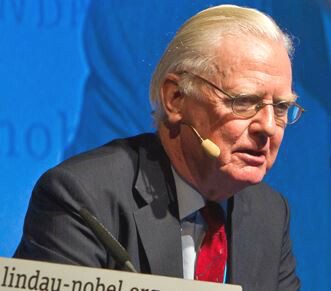 Capping income with 100 percent top marginal tax rates, Nobel laureate Sir James Mirrlees noted in Germany last week, can make economic sense in a variety of situations. Every August, for most of the last four decades, top central bankers from around the world have been making their way to the Wyoming mountain resort of Jackson Hole for an invitation-only blue-ribbon economic symposium. This year’s Jackson Hole hobnob, once again hosted by the Federal Reserve Bank of Kansas City, last week attracted the usual assortment of central bankers, finance ministers, and influential business journalists. But this year’s gathering also attracted something else: protesters. Over 70 groups and unions backed the protest and signed onto an open letter that calls on America’s central bankers to start nurturing an economy that works for workers. At one point, early on in the Jackson Hole gathering, protesters actually had a brief exchange with Federal Reserve Board chair Janet Yellin. For the first time ever, activists have converged on the central banker annual gathering at Jackson Hole. But that “everything” remains distinctly dispiriting. Many of Yellin’s fellow central bank officials, protesters note, are pushing the Fed “to put the brakes on growth so wages don’t rise” and, the fear goes, stimulate inflation. Those “brakes”— higher interest rates — are definitely coming, Kansas City Fed president Esther George told protest leaders in another Jackson Hole exchange. America needs them, she added, to better “balance” the economy. The green-shirted protesters at Jackson Hole had plenty of support for that stance at last week’s other blue-ribbon global gathering of economic dignitaries, Germany’s fifth Lindau Meeting on Economic Sciences. No hotshot central bankers show up in Bavaria for this Lindau conference, only Nobel Prize laureates in economics and aspiring economic researchers from around the world. This year’s Lindau event attracted half the world’s living Nobel laureates and over 450 young economists from more than 80 countries. The central focus of their dialogue? Our increasing global maldistribution of income and wealth. Session after session zeroed in on “drivers of rising inequality” and the “counteractive measures” that can narrow our global divides. A central focus of this year’s Lindau discourse: inequality. Wages for average U.S. workers, Stiglitz notes, have fallen over the past 40 years — at the same time that American worker productivity has doubled. A practical political possibility? Perhaps, says Mirrlees. “Particularly in Europe,” he observes, serious people are already discussing limiting banker pay. In Europe, serious people are debating limiting banker compensation. In the United States, on the other hand, concern about income and wealth concentration hasn’t yet reached the point where ideas as bold as income caps are gaining any significant traction. Why not? Another Lindau presenter, Judith Niehues of Germany’s Cologne Institute for Economic Research, has some clues. Niehues has analyzed surveys of public perceptions about inequality in two dozen European nations and the United States. In all these nations save one, her research has found, people overestimate the level of inequality around them. On average, for instance, the French believe that just under 15 percent of their nation’s households have incomes that fall between 80 and 110 percent of France’s median — most typical — income. In fact, nearly 28 percent of the French have middle class incomes. And the share of the French people living in poverty, with incomes less than 60 percent the nation’s median income, is actually running at just half the poverty level that the French people estimate. The one nation where people underestimate the inequality that engulfs them? The United States. Americans believe that just over a quarter of their fellow Americans, 25.7 percent, have incomes that fall between 80 and 110 percent of the national median. The actual share of Americans clustered in this statistical middle: just 15.3 percent. The United States, in sum, doesn’t just have the world’s most unequal major developed economy. The United States has the most people in denial about the inequality they live amid. Niehues doesn’t go into the reasons for this denial. Her new paper does note one consequence: People who underestimate their society’s level of inequality turn out to be less likely to support policies that would help distribute their society’s income and wealth more equally. Inequality, in other words, matters. But the perception of inequality may matter — in the struggle for a fairer future — even more.